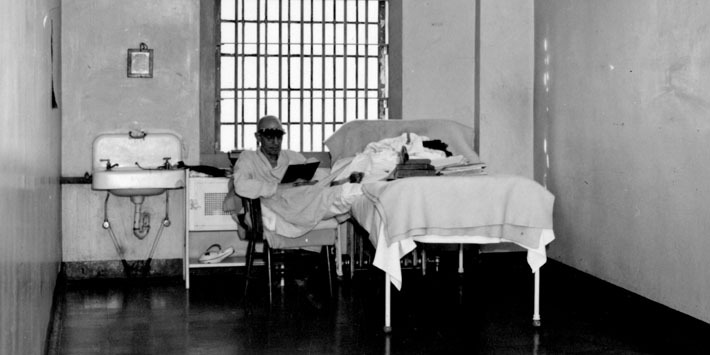 Medical care was one of only four basic rights granted to prisoners at the Alcatraz penitentiary. Inmates exercised their right at sick call: every day after lunch, prisoners could line up to ask to be taken to the Hospital upstairs from the Dining Hall. One former officer claimed that as many as 10 percent of inmates would appear in the sick line on a given day, either suffering from genuine illness or hoping for an escape from regular life in the cellblock. The Hospital was staffed by a general practitioner who lived on the island, while specialists, surgeons, and psychiatrists from the San Francisco Public Health Service and the Presidio military base visited when needed. Female nurses or assistants sometimes accompanied the surgeons — the only time women were ever allowed inside the cellhouse. A doctor who worked on Alcatraz described the inmates falling totally silent — whether out of respect or sheer astonishment — at the sight of a female anesthetist walking the length of the cellhouse to the Hospital. Each ward cell in the Hospital could hold as many as six men, but inmates were usually kept separate for safety reasons. Among the prisoners who spent time in these cells were Al Capone, confined to the Hospital in 1938 after being diagnosed with syphilis; and Robert “Birdman” Stroud, who lived in the infirmary for 11 years. A hypochondriac as well as an extremely disruptive inmate who had incited a riot in D Block, Stroud was permanently moved to the Hospital in 1948 to keep him out of the general population. Set apart from the regular ward cells are two psychiatric observation rooms, called “bug rooms” or “bug cages” by inmates. The number of prisoners who became mentally ill during their time on Alcatraz is hard to pin down: the official estimate of Warden James A. Johnston was two percent, but former inmate Jim Quillen said it happened “a lot more than that — all the time.” Many aspects of life on Alcatraz could drive inmates over the edge: the monotony, the lack of privacy, the threat of violence, even the knowledge that San Francisco and freedom were so close but impossible to reach. However, some prisoners also tried to fake insanity, hoping for a chance to be transferred to another institution — anywhere other than Alcatraz. Alcatraz Hospital was one of the sites of the FOR-SITE project @Large: Ai Weiwei on Alcatraz, on view September 27, 2014, through April 26, 2015.